It’s the start of the business day in Canada when I connect with Raj Narula (BASc [Mechanical Engineering] ʼ80) in New Delhi, India, via FaceTime. Slightly flustered by the bustle of activity I hear in the background and the time difference, I explain that this is my first phone call to India. He simply chuckles—communicating across continents is business as usual for Narula. It’s 6:30 p.m. New Delhi time and Narula has just arrived, on yet another business trip to the country where he was born. He has become well known in both Canada and India for being a “go-to” person for Canadian technology companies trying to break into the Indian market. It all began about 15 years ago, when Narula took over a struggling Canadian tech firm that was on the brink of bankruptcy. While others might have seen the company as a sinking ship, Narula saw a chance to do something big. He helped build up the company using his connections overseas in India. The hunch he acted on worked out, and before very long, there was interest in the firm and it was acquired by a company in India. That’s when Narula saw an enormous opportunity to help bring Canadian tech and innovation to India. Together with a colleague, he soon founded TaraSpan, a company that in less than five years grew from two people into a team of 150 and India’s top firm for helping global companies enter the huge Indian market. TaraSpan clients have included technology giants such as Ericsson, IBM, Amdocs and Mitel. In the summer of 2014, Narula chose to leave TaraSpan to focus on his next venture. In the meantime, he continued to lead trade delegations to India, bringing many Canadian companies and some universities to that country for the first time. When asked why he chose India, Narula explains that the country boasts a rapidly growing market that is constantly changing. The Chinese market is bigger, confirms Narula, but there are more barriers to entering that market—such as language. Furthermore, India possesses a very service-oriented market. And language is less of an issue, as English is one of the country’s official languages. There is also a vast diaspora of people with roots in India who are playing key roles in the global technology market. Last but not least, he points out that India is home to one of the largest mobile phone markets in the world, with the vast majority of devices being Android, which are much cheaper. As a result, iOS devices (iPhones and iPads) are far less prevalent in India than in North America, he says. Narula’s latest focus is on connecting Canada and India through education. The Indian government has called upon its National Skills Development Corporation to “skill up” more than 150 million people by 2022. He is currently a board member on SKILLSdox, which focuses on connecting Canadian education leaders to the Indian marketplace through online education. He has also created a new company, InCa Synergies, which looks at combining education and innovation through a blended learning approach. In addition, Narula is an active member of the University of Ottawa Alumni Association’s board of directors and has been a tremendous help advising the University on how to build a presence in India. Narula also co-founded the Ottawa chapter of TiE, a global network of entrepreneurs in 55 countries. A natural fit after all, since his father was a career diplomat and his family used to move every three years. He grew up in cities like Tehran, New Delhi, Rome and Georgetown, arriving in Ottawa in his teens. He speaks multiple languages and has travelled to more than 50 countries. Narula also started the Haveli Indian Restaurant with his brother, Ravi, in 1984. The restaurant is still thriving today, in Ottawa’s ByWard Market, 31 years later. The family was also instrumental in creating the Maharaja’s Ball charity event in 2006. Always an innovator, problem solver and, of course, an engineer, Narula was recently named the 2015 recipient of the Faculty of Engineering’s Alumni Award of Excellence. 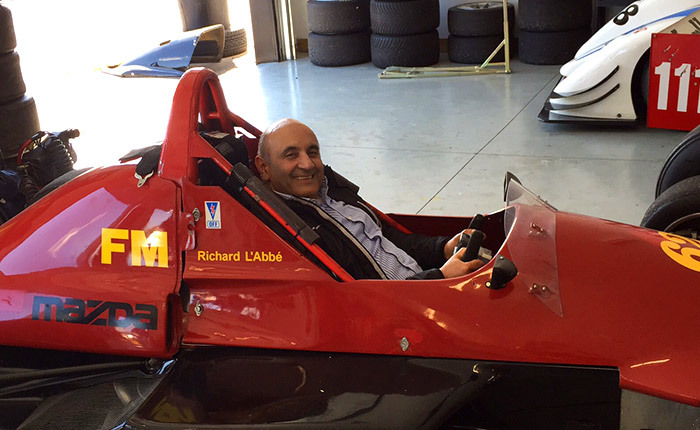 Raj Narula sits in a racecar owned by Richard L’Abbé (BASc '79), winner of the 2013 Alumni Association’s Meritas Tabaret Award. Narula and L’Abbé are good friends.